Climate change has taken us to the end of Stationarity, of having constants to base predictions for weather and, as a result, many other economic and social norms we have come to expect. 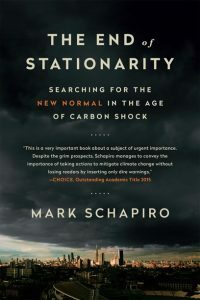 Mark Schapiro explores several diverse and unexpected impacts of climate change, attempts to limit it, and surprising opportunities. Join us to explore the new non-norms and where to look in our on-going journey to make a more sustainable future.